At the accommodation facilities next to the paraffin thermal water, your smiling hosts will make sure you are in a good mood long after you leave! In Terme Lendava, at the foot of Lendavske gorice, your cares will simply float away as your body absorbs the beneficial energy in this beautiful green resort where nature was so generous with its gifts. The Hotel Lipa is situated next to the thermal pool complex and a large park of linden trees. On one side you can enjoy the view of Lendavske gorice, while on the other, behind the thermal pools, you can admire the vast Prekmurje plains. In the hotel, you will meet your friendly hosts who swear by the motto that a good mood is the best medicine. They will keep you in good cheer with delicious homemade food and fine local wine, while the hotel health and wellness services and swimming pool will improve your health. This cyclist and hiker-friendly hotel is an excellent starting point for exploring the energy-rich surroundings. Here, you can recharge your batteries and return home in a great mood! The Hotel Lipa is a three-star hotel with 120 rooms. It has four floors and two lifts. Some rooms have air conditioning, a bathroom with a shower and a balcony with a view of the pool, the Prekmurje plains or the nearby hills. The hotel has indoor and outdoor thermal pools. In the Hotel Lipa, you will find a buffet restaurant, the Taverna and the Aperitif Bar. Five hotel pools: the indoor thermal pool (32-34 °C), the outdoor winter and summer thermal pool (34-36 °C), the indoor recreational pool (30-32 °C), the indoor children’s pool (30-32 °C, 10 to 45 cm deep) and the Gejzir outdoor thermal pool (36-38 °C). The hotel guests also have free admission to the three summer pools in the outdoor pool complex: the Olympic-size pool (26-29 °C) with three waterslides, the outdoor children’s pool (26-29 °C, 15 to 60 cm deep) with two waterslides and the Grozd thermal pool (36-38 °C). The indoor pools are open from 7:00 to 20:00. The outdoor pools are open from 9:00 to 20:00, while the Gejzir thermal pool is open from 7:00 to 20:00 and the Grozd thermal pool is open from 8:00 to 20:00. Night swimming is available on Fridays and Saturdays from 20:00 to 23:00. The indoor pools and outdoor pools connected to the hotel are open all year round. The summer pools in the outdoor pool complex and the Gejzir thermal pool are open during the summer season, from 1.5. to 30.9. Bathrobes are available free of charge for half-board guests. The buffet restaurant and the Aperitif Bar are in the hotel, while the Taverna is connected to it. Breakfast is served from 6:30 to 9:30, lunch from 12:00 to 14:00, and dinner from 18:30 to 20:30 in winter and 19:00 to 21:00 in summer. The Aperitif Bar is open from 6:30 to 12:00. In the Taverna, brunch is served from 10:30 to 13:00, while lunch and dinner are served from 11:30 to 23:00 (from 11:30 in the winter). By the outdoor thermal pools, you will find the Bikini Bar (11:00 to 18:00), while the fast-food ŠRC Bar is open during the summer holidays (11:00 to 18:00). The apartment guests have free admission to the hotel saunas (2 Finnish, 1 Turkish, 1 infrared). They are open from 12:00 to 20:00 (Sunday to Thursday) and from 12:00 to 23:00 (Fridays and Saturdays). Our wellness services also include various baths, thermal therapy, crystal therapy, chromotherapy, acupuncture, massage therapies and physiotherapy. The wellness centre is open from 8:00 to 16:00 (Monday to Thursday), from 8:00 to 18:00 (Fridays and Saturdays) and from 8:00 to 12:00 (Sundays). The Terme Lendava Health Centre offers treatments for alleviating rheumatic and degenerative conditions, respiratory diseases and skin diseases. It also has a centre for thyroid diseases. The Health Centre is open from 8:00 to 16:00 (Monday to Friday) and from 8:00 to 13:00 (Saturdays). On Sundays, massage therapies are available from 9:00 to 13:00. Terme Lendava is situated in the very east of Slovenia. Motorway access: Coming from the west, drive towards Maribor and take the A5 towards Murska Sobota and Lendava. Take the exit for Lendava (exit 12). At the roundabout, take the exit for Lendava, follow the overpass and take the exit for Lendava again at the next roundabout. At the third roundabout, take the second exit, marked Terme Lendava. Access via regional roads: From the west, drive towards Maribor and continue through the towns of Gornja Radgona, Murska Sobota, Beltinci and Črenšovci to Lendava. At the roundabout, take the exit for Lendava, follow the overpass and take the exit for Lendava again at the next roundabout. At the third roundabout, take the second exit, marked Terme Lendava. It is 200 km to Ljubljana, 300 km to Trieste, 450 km to Venice, 700 km to Milan, 520 km to Munich, 290 km to Klagenfurt, 390 km to Salzburg, 230 km to Vienna, 265 km to Budapest, 125 km to Zagreb and 495 km to Belgrade. The Lendava coach station is 1.5 km away and it is 1.3 km to the railway station. Maribor Airport is 86 km away. Comfortable double room with a 2 x 90 cm bed or two separate 90 cm wide beds and balcony with a view of the park, the pool or parking lot. The room (14 - 15 m2) features a bathroom with shower and toilet as well as a desk. 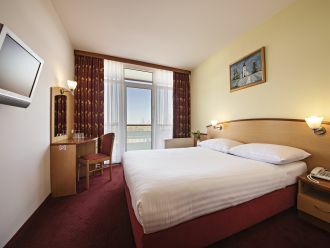 Comfortable double room with a 160 cm wide queen-sized bed and balcony with a view of the parking lot. The room (13 - 15 m2) features a bathroom with shower and toilet as well as a desk and sofa bed. 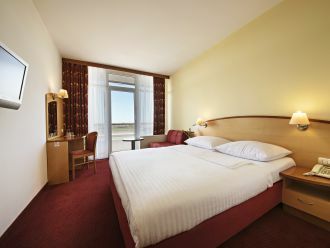 Comfortable suite with a 180 cm king size bed and balcony with a view of the park or the hotel swimming pool. The room (30 - 34 m2) features a bathroom with bathtub and toilet as well as a desk and two-seater sofa. One lunch in the Hunting lodge. In Terme Lendava at the foot of Lendavske gorice, your cares will simply float away as your body absorbs the beneficial energy in this beautiful green resort where nature was so generous with its gifts. In combination with other natural healing factors (mud wraps, herbal wraps and more), the Terme Lendava paraffin-rich water has been used for almost h ...alf a century to relieve rheumatic and skin conditions, treat respiratory diseases and help with osteoporosis. In its unfiltered form, you can find it in two green natural water pools, while the indoor and outdoor thermal pools are filled with filtered thermal water. There is also an Olympic-size pool, which is open in the summer. The Terme Lendava Health Centre has highly qualified staff, experienced in combining medical knowledge with the gifts of nature. We specialise in rheu ...matic and degenerative diseases, post-trauma and post-operative conditions of the locomotor system and non-infectious skin and respiratory diseases. We also have a centre for thyroid diseases. Don’t miss our Lyndva gels, a wonderful remedy that helps combat tiredness and rheumatic problems. At Terme Lendava, we believe that well-being comes from nature. Our treatments are based on paraffin water, herbs and healing mud. We also believe in ...the power of acupuncture for relieving health issues. Guests can choose from four saunas enhanced with beneficial crystals and colours. Thanks to our paraffin water baths combined with thermal therapy and physiotherapy, you will return from your holiday feeling completely reborn! Next to the outdoor pool complex you will find five energy points, which relieve muscle tension and tiredness, alleviate mental and emotional stress, ...clear the respiratory pathways, and strengthen the cardiovascular system, bone tissues and organs affected by rheumatism. The barefoot trail is a particularly unique energy place. Walk the trail to stimulate the acupressure points, cleanse yourself of negative energy and absorb fresh, positive energy. Our guests can take part in a number of free workouts, many of which are also suitable for older people. During the morning workout, we serve energise ...d water to keep up your energy level throughout the day. The area boasts numerous cycling trails winding among hills topped with churches and vineyards, while some even cross the border into the neighbouring Croatia or Hungary. We also organise hikes with picnics, tastings and sightseeing. Guests can explore the combination of Slovenian, Croatian and Hungarian culinary traditions daily in the Hotel Lipa buffet restaurant. The hotel’s Tav ...erna features a summer terrace where you can treat yourself to “pereci” (traditional bread rolls) and enjoy the local wines from the nearby Lendavske gorice. Guests can also try the Aperitif Bar, as well as two bars in the outdoor pool complex that are open during the summer. There you will even find XXL dishes for our hungriest visitors. There are plenty of summer activities in and around the pool to entertain guests of all ages. With our ever-cheerful entertainment coordinators, you a ...re guaranteed to have fun! Miha the Knight joins us during the school holidays, teaching children about ancient traditions and making sure they get lots of fresh air. Younger children can splash around in the indoor and outdoor children’s pools with a waterslide, while the Olympic-size pool has a total of three waterslides. The large park of linden trees next to the pools offers plenty of refreshing shade even in the hottest summers. Absorb the energy of Lendava! In Lendava, the different cultures of Slovenia, Hungary and Croatia live side by side. This was once the location of the Amber Road but the amber has now been replaced by the thermal mineral springs, excellent cooking, top quality wines, cycling and fishing in and around the picturesque branches of the Mura. The region is also famous for its energy field – visit some of the many energy points in and around Terme Lendava and recharge your batteries.